The last step is to aggregate the buffered exposure representation to every census block. Here's where I'm stumped. I've had good times with the %over% functions in the sp package so far, but understand from the over vignette that poly-poly and poly-line over are implemented in rgeos. The vignette only covers line-poly and self-referencing poly, and not with aggregation, so I'm a bit confused on what my options are for poly-poly with function aggregation, like sum or mean. For a test case, consider the below, somewhat verbose snippet working with the world country borders file. This should be able to be copied out and run as is, since I'm using a random seed for the points and since I'm downloading and unzipping the world file in code. First, we create 100 points, then use the over function with the fn argument to add up the element in the data frame. There are a lot of points here, but take a look at Australia: 3 points, number 3 as a label. So far, so good. Now we transform geometries so we can create buffers, transform back, and map those buffers. (Included on previous map, since I'm limited to two links.) We want to know how many buffers overlap each country - in Australia's case, by eye, that's 4. I can't for the life of me figure what's going on though to get that with the over function. See my mess of an attempt in the final lines of code. EDIT: Note that a commenter on r-sis-geo mentioned the aggregate function - also referenced on stack exchange question 63577 - so a work around / flow might be through that function, but I don't understand why I'd need to go to aggregate for polypoly when over seems to have that functionality for other spatial objects. orig.world.map = world.map #hold the object, since I'm going to mess with it. plot(points.spdf, col="red", pch=20, cex=1, add=T) #...and add points. 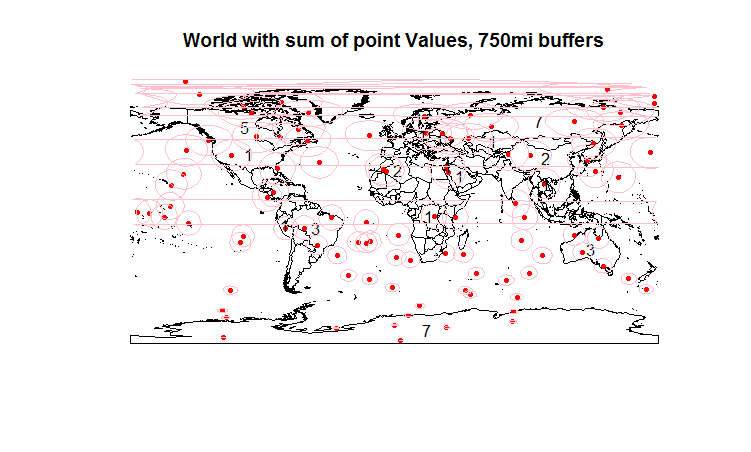 plot(world.map, main="World with sum of points, 750mi buffers") #Note - happens to be the count of points, but only b/c val=1. #Now over with the buffer (poly %over% poly). How do I do this? join.df = data.frame(unname(over(geometry(world.map), pointbuff.spdf, fn=sum, returnList = F)) ) #Seems I need to unname this...? world.map@data = data.frame(c(world.map@data, join.df)) #If I don't mess with the join.df, world.map's df is a mess..
#^ But if I do strip it of labels, it seems to be misassigning the results? # Australia should now show 4 instead of 3. I'm obviously super confused, probably about the structure of over poly-poly returns. Help? Thanks for the clear question and reproducible example. also counts the number of intersections, but only with the fixed rgeos version installed. Its advantage, besides a more intuitive name, is that it directly returns a Spatial object, with the geometry of world.map. to your script, before you use over. I whipped up a quick (and poorly coded) over-replacer in the meantime that creates the data frame I need, since my question isn't quite answered by the above counting-only solution or "work off the new rgeos", which I'm not quite skilled enough to understand how to do. This function is clearly (1) incomplete (notice how I ignore the fn argument) and (2) inefficient, since I'm coming at it without R's powerful array manipulations / sapply... (clearly I'm coming from other languages without that power) but honestly, I'm still confused what the structure of the over function returns (list of lists...? And blank lists if NA?). For what it's worth (edits welcome), this function does the work I need done, successfully, and mimicks the action of the other over functions. Not the answer you're looking for? Browse other questions tagged r point-in-polygon sp de-9im or ask your own question. Why did spTransform fail here?